Lisa Lombardo January 14, 2019 January 27, 2019 32 Comments on Self Reliance Bloggers’ MEGA Giveaway! This giveaway has ended…the winner will be announced Tuesday, January 29th, 2019. Thank you to everyone who sponsored a prize and everyone who entered! I joined forces with some amazing bloggers for the month of January to share our experience and adventures in self reliance. We are trying new projects, working on self reliance at home, stretching our skills, and sharing it all with our readers. Did I mention that we are having a LOT of fun doing it? Not to mention that we are hosting a Mega Giveaway of awesome prizes that will all go to one lucky winner! We’ll pay shipping and sales tax, all you have to do is enter for a chance to win! How cool is that?! I’m really enjoying getting to know all of the wonderful bloggers taking part in the challenge and the giveaway…I hope you stop by and check out their blogs. 🙂 You can find liks to all of their blogs in the Self Reliance Challenge. We got together to sponsor a whole bunch of great prizes! There are a ton of ways to enter for chances to win, too. The more entries you complete, the greater your odds of winning. The first two entry options are things you can do every day to earn entry points…and it’s completely free! You don’t have to buy anything to enter, and purchasing a product throught one of our affiliate links will not increase your odds of winning. Simple right? Giveaway begins at 6am CST on January 14th and ends at 6pm CST on January 26th, 2019. For our Canadian Readers, please visit Farm Gal over at Just Another Day on the Farm for her giveaway for Canadian citizens! Here is the link to her awesome giveaway! This page contains affiliate links. You will not pay any extra for your products, but I will receive a small commision if you purchase products through these links. Learn how to save seeds from heirloom crops. Packets for shaving seeds and plant tags for identifying your plants included. Seed Sowing And Saving: Step by Step Techniques for Collecting and Growing More Than 100 Vegetables, Flowers, and Herbs valued at $19.95, 50 Bamboo Plant Labels in Gift Box valued at $9.99 & 50 Blank Seed Saving Packets valued at $4.99 sponsored by The New Homesteader’s Almanac! Learn how to garden organically with this ebook and course. Getting Started with Organic Gardening Ebook and Course valued at $29.95 sponsored by Experimental Homesteader! One lucky winner will get to munch on delicious cookies while reading some amazing books! One Dozen Oatmeal Chocolate Chip Cookies by Tressa & Trudy Bakery shipped value of $20 sponsored by A Life in The Wild! The Self Sufficient Life and How to Live It by John Seymour value of $35 sponsored by The Farm Wife! 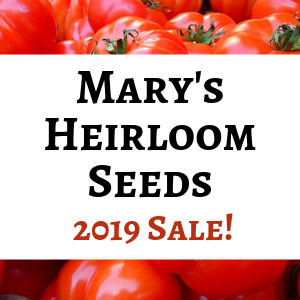 Mary’s Heirloom Seeds has a great selection of seeds for only 99 cents a packet. Choose the varieties that you want to grow! Winner’s choice of 15 packets of 99 cent seeds valued at $14.85 sponsored by Mary’s Heirloom Seeds! Filled with recipes, tips on gardening, natural cleaning and beauty products you can make, and stories from the author’s homestead…Melissa Norris is an entertaining author! The Made From Scratch Life: Simple Ways to Create a Natural Home by Melissa K. Norris valued at $12.99 sponsored by Organic 4 Greenlivings! One of the most popular home preservation guides you can buy (or win! ), the Ball Blue Book Guide to Preserving is loaded with useful advice and delicious recipes! Ball Blue Book Guide to Preserving 37th edition $12.60 value, sponsored by Nancy On The Homefront! These 2 fertilizers are organic and all natural! Your vegetable garden will thank you for feeding it! Fertilizer Combo of Mountain Flower Root Boost 1 pound package valued at $9.95 & Mary’s Organic Plant Food 4-6-2 1 pound package valued at $8.95 sponsored by Stone Family Farmstead & Hidden Springs Homestead! The lucky winner will get to choose from one of these wonderful ‘How to’ ebooks by herbal guru, Heidi Villegas! Winner’s choice of e-book: Hot Process Soap MakingorHerbal Salves, Oils, Butters, and Balms valued at $10 sponsored by Healing Harvest Homestead ! 10 Hand Drawn Seed Saving Packets for popular seeds value of $9.99 sponsored by Home & Harrow! You can enter with all of the options below to increase your odds of winning! You can enter every day by tweeting the contest or leaving comments in the comment section below! You must be a citizen of the United States (including all 50 states and the District of Columbia) to be eligible to win the prize. Some prizes may not be available for shipping outside of the contiguous United States and will be forfeited by entrants with mailing addresses outside of the contiguous United States. All decisions are final and are at the sole discretion of The New Homesteader’s Almanac. Winner will be contacted by email after the giveaway ends. If the first randomly chosen winner does not reply to claim their prize within 48 hours of notification, a new randomly chosen winner will be contacted. Please add the email address lisalynn@newhomesteadersalmanac.com to your contacts to be sure your notification email does not get lost in your spam folder, or check your spam folder for the notification email. Upon acceptance of prize, winner accepts sole responsibilty for reporting value of giveaway prize as ‘other income’ on their state and federal taxes, as required by law. Sweepstakes sponsor is not responsible for taxes or fees, if there are any, on prize package. Visit Just Another Day on the Farm and Farm Gal for the Canadian giveaway for our Canadian readers! » Black Friday and Giveaway Reminder! I would love to win this to add to my collection and help me be more self-sufficient. I am particularly interested in The Made From Scratch Life! Thanks! It looks like a great book…wish I had more time to read! I would love to win-have two acres to work into something more than yard. That’s great, Tena! there are so many ways to be a little bit more self reliant. 🙂 Best wishes! Take charge of your own food supply! Plant on! Great sentiment, Megan! I love growing my own food! Ooh, seeds and books, this is a great giveaway. So excited to find this blog ! So much to learn!! Thanks, Leila! Happy to have you here! This would be an awesome addition to my self sufficient collection. Thank you for the opportunity. Happy to share! Thanks for stopping by! What a great contest to get people thinking about self reliance and homesteading. Thanks, Chris! Just trying to help people out! Thank you so much for all the work you have put into this. I am so excited! I’m very happy to share the giveaway! Thanks for stopping by and entering for a chance to win! Sorry but I could not get to the page on Twitter for the 15 Acre Homestead…it says the page does not exist…tried a bunch of different ways but no luck. Other than that all the links went great! Thank you all! This is fantastic! Thank you all! I am working at becoming more self reliant baby step by baby step. Best wishes with your steps to self reliance, Joanne!